Between Occupy and Freddie Mac, What’s a Mayor To Do? In any city, it’s the mayor’s job to uphold the law. That we all know and expect of our civic leaders. But, it’s a different story when the law involves ejecting people from a house during the process of foreclosure. That’s the situation of Minneapolis Mayor RT Rybak, who even though he has declared “the city is not in the foreclosure business” finds himself criticized by the Occupy Homes movement. Activists defending the home of David and Alejandra Cruz have accused the Mayor of saying one thing and doing another. After the Mayor and Minneapolis Police Chief Tim Dolan said, “We’re done here,” during a recent raid on the Cruz home, police continue to remove Occupy activists. Rybak says he will continue to enforce the law, even though he faults Freddie Mac for their inflexibility and their unwillingness to work with his office or the homeowner. Last week, he spent several hours on the phone with an executive from Freddie Mac trying to work out a deal to keep the Cruz’s in their home. Those efforts ended in frustration, he says. As far as calling in local law enforcement to secure the house, the mayor claims he is trying to keep the peace at 40th and Cedar. “The neighbors have a concern. 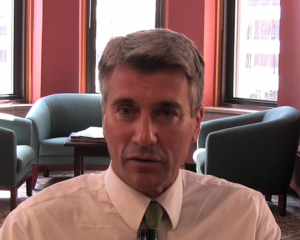 They don’t want their neighborhood to be a staging ground for protests,” says Rybak. Many houses dotting the area around the Cruz home have the signature red sign that reads, “STOP FORECLOSURES, STOP EVICTIONS.” Many neighbors support the Cruz’s and their efforts to stay in the house. Rybak says we may not like the boards there, but re-occupation of the home is trespassing, and his office has a duty to enforce the law. “People can say crummy things about the mayor but the worst thing you can say is that I didn’t do anything,” Rybak says of his critics. Rybak credits himself with being one of the more progressive mayors in the country and that’s why, he says, he wants to start bringing more lenders such as Freddie Mac to the table to talk about the impact their lending practices have on communities and the strain they place on local law enforcement. Next week he’ll attend a national conference of mayors and will talk about this issue. Allison Herrera, originally from San Luis Obispo, Calif., studied media and Spanish at Evergreen State College in Olympia, Wash., where she earned her bachelor s. Since moving to the Twin Cities, she has been a news producer for KFAI Fresh Air Community Radio, communications coordinator for Twin Cities Public Television's arts series MN Original, and producer for the Association of Minnesota Public and Educational Radios Stations for the series MN90: Minnesota History in 90 Seconds. That an undocumented immigrant family and a ragtag group of Occupy Homes activists could force the mayor of a major American city to call Freddie Mac was a testament to the power of Occupy. The police killing of an unarmed black man in Ferguson, Missouri, has rekindled a simmering debate over how to deal with police violence in Minneapolis, Minnesota. Occupy Homes is calling for the Minneapolis Police Department to follow its own foreclosure protest protocol, which requires a number of steps before people can be arrested. The demand came after seven people occupying vacant houses were arrested within 10 days in March.